Acknowledged author Diana J. Mason RN PhD FAAN wrote Policy & Politics in Nursing and Health Care, 7e comprising 784 pages back in 2015. Textbook and etextbook are published under ISBN 0323241441 and 9780323241441. 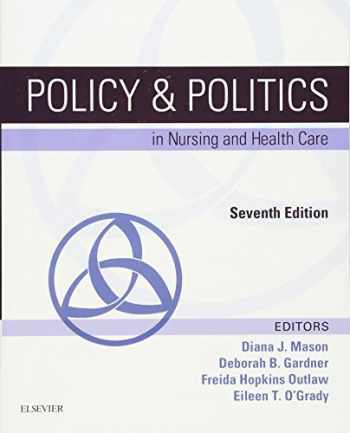 Since then Policy & Politics in Nursing and Health Care, 7e textbook received total rating of 4 stars and was available to sell back to BooksRun online for the top buyback price of $25.90 or rent at the marketplace. Featuring analysis of cutting-edge healthcare issues and first-person stories, Policy & Politics in Nursing and Health Care, 7th Edition is the leader in helping students develop skills in influencing policy in today’s changing health care environment. Approximately 150 expert contributors present a wide range of topics in this classic text, providing a more complete background than can be found in any other policy textbook on the market. Discussions include the latest updates on conflict management, health economics, lobbying, the use of media, and working with communities for change. With these insights and strategies, you'll be prepared to play a leadership role in the four spheres in which nurses are politically active: the workplace, government, professional organizations, and the community. Comprehensive coverage of healthcare policies and politics provides a broader understanding of nursing leadership and political activism, as well as complex business and financial issues.Taking Action essays include personal accounts of how nurses have participated in politics and what they have accomplished.Expert authors make up a virtual Nursing Who's Who in healthcare policy, sharing information and personal perspectives gained in the crafting of healthcare policy.Winner of several American Journal of Nursing "Book of the Year" awards!NEW! Nine new chapters ensure you have the most up-to-date information on key topics such as ethical dimensions of policy and politics, patient engagement, public health, women's reproductive health, emergency preparedness, new health insurance exchanges, and much more.NEW! The latest information and perspectives are provided by nursing leaders who influenced health care reform, including the Affordable Care Act.NEW! Emphasis on evidence-based policy throughout the text.NEW! A list of web links is included in most chapters for further study.